US Gold and Silver Junior Exploration Company – Come Join Us! $MISM Mission Mining Company – World’s Largest Known Rhenium Deposit? Mission Mining Company (OTC Pink:MISM) – Mission Mining Company is pleased to report that its potential in-ground Rhenium resources likely make the El Dorado Mine one of only three known significant deposits of Rhenium in existence. If further testing confirms the initial data, the El Dorado may possibly hold the world’s largest known Rhenium deposit. Worldwide demand for Rhenium is increasing rapidly, and is in danger of outpacing supply. This creates a unique business opportunity for Mission Mining Company. As a result of securing both the El Dorado Mine and the Gold Star Mine, Mission Mining Company has strategically positioned itself within the precious metals mining industry to potentially become one of the largest mining companies in North America. Future production from these mining properties, as well as from other possible acquisitions now being reviewed by Management, is anticipated to generate substantial revenues and profits for the Company for the benefit of its shareholders, thus allowing the Company to achieve its goal of evolving into a global leader in the mining industry. As an important step in its mine development strategy, the Company plans to conduct additional, extensive, third party testing by qualified and certified geologists, mining engineers, and assayers in respect of each of its mining properties so as to verify and clarify published in-ground resource quantities and values as stated in the existing / historical test reports, assays, and valuation reports. What is Rhenium, and why is it important? Rhenium (Re), the last naturally occurring element to be discovered, was discovered in Germany in 1925. The process was so complicated and the cost so high that production was discontinued until early 1950 when tungsten-rhenium and molybdenum-rhenium alloys were prepared. These alloys found important applications in industry that resulted in a great demand for the rhenium produced from the molybdenite fraction of porphyry copper ores. Important uses of rhenium have been in platinum-rhenium catalysts, used primarily in producing lead-free, high-octane gasoline and in high-temperature super alloys used for jet engine components. Turbine blades have typically contained about 3% rhenium. The newest generation contains about 1.5% rhenium. Aircraft engine manufacturers have been trying to reduce the amount of rhenium in engines, because worldwide demand for the metal is in danger of outpacing supply. Rhenium is widely used as filaments for mass spectrographs. Rhenium is also used as an electrical contact material. Rhenium catalysts are exceptionally resistant to poisoning from nitrogen, sulfur and phosphorous and are useful in the hydrogenation of fine chemicals. Rhenium’s uniqueness is its high melting point (3,180 C) and high density (21.04 g/cc). Products from rhenium can be thermally cycled thousands of times with no effects. Although testing and assaying results to date indicate the El Dorado Mine holds significant quantities of gold, the El Dorado Mine has significant other potential. The claims are uniquely situated near one of the few currently operational rare earth elements (REE) mines in the U.S., and in limited testing, it has been determined that the El Dorado Mine also contains REE. Commercial ore values are likely located on each of the seventeen (17) contiguous BLM lode claims which comprises the El Dorado Mine. The claims are proximate to existing roads, and are anticipated to be simple to access, mine, and process due to the near-surface ore deposit. The values are contained in an intrusive and massive Rhyolitic host rock structure lying at or very near the surface, below a very thin basaltic cap, holding significant values based on testing and assaying to date, including the Platinum Group Metals (PGM’s), Gold (Au), and Rhenium (Re). The possible tonnage of commercial grade ore which could be mined from the existing seventeen (17) El Dorado Mine claims could potentially exceed four hundred million (400,000,000) tons. It is likely that the ore can be mined using conventional methods (open pit mining), requiring no underground tunneling or extensive underground networks, while several of the Platinum Group Metals (PGM’s), plus Gold (Au) and Rhenium (Re), should be easily and profitably extractable, utilizing industry standard methods. This release may contain &quot;forward-looking statements,&quot; within the meaning of Section 27A of the Securities Act of 1933, as amended, and of Section 21E of the Securities Exchange Act of 1934, as amended, and such forward-looking statements are made pursuant to the safe harbor provisions of the Private Securities Litigation Reform Act of 1995. 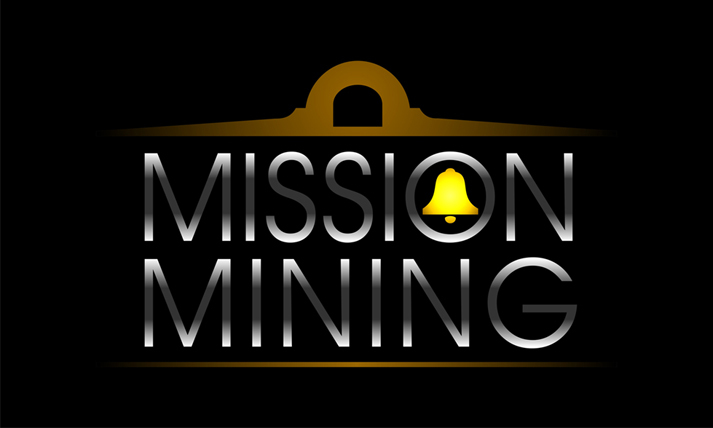 Those statements include statements regarding the intent, belief, or current expectations of Mission Mining Company and members of its management, as well as the assumptions on which such statements are based. Prospective investors are cautioned that any such forward-looking statements are not guarantees of future performance and involve risks and uncertainties, and that actual results may differ materially from those contemplated by such forward-looking statements. Important factors currently known to management that could cause actual results to differ materially from those in forward-looking statements include fluctuation of operating results, the ability to compete successfully in its market segment, and the ability to complete some or all of the before-mentioned transactions. The company undertakes no obligation to update or revise forward-looking statements to reflect changed assumptions, the occurrence of unanticipated events, or changes to future operating results. US Gold and Silver Mining - Our Nevada & California mining properties are anticipated to hold extremely large precious metals resources. The Company has posted over $400 Million in Assets in its OTC Filings. Come join us! This entry was posted in Uncategorized and tagged banks, bullion, currencies, currency, currency trading, deflation, depression, dollar, economic, economic collapse, economic news, economic recovery, economy, ETF, euro, Fed, Federal Reserve, finance, forex, global economy, global recession, gold, gold bars, gold bullion, gold coins, gold investing, gold mine, gold mines, gold mining, gold prices, gold stocks, IMF, inflation, investing, MISM, Mission Mining, Mission Mining Company, national debt, PGM, physical gold, physical silver, platinum, platinum group, portfolio, precious metals, rare earth, rare earth elements, rare earths, recession, REE, silver, silver bars, silver bullion, silver coins, silver investing, silver mine, silver mines, silver mining, silver prices, silver stocks, stock market, trading, World Bank. Bookmark the permalink.